A 16-strong QTU delegation of rank and file members and officers attended this year’s Australian Education Union (AEU) Federal Conference, hosted by our Victorian colleagues at the AEU Vic Branch headquarters in Abbotsford, Melbourne. Conference heard from former AEU and ACTU President Sharan Burrow - now General Secretary of the International Trade Union Confederation - on the international campaigns to eliminate slavery, create climate justice and attack corporate greed. The Australian Greens Leader Richard De Natale, the Federal Opposition Leader Bill Shorten, and Deputy Opposition Leader Tanya Plibersek outlined their policy positions to Conference in the lead up to the next federal election. The Greens outlined the need to Close the Gap, restore funding to TAFE and fix the federal funding model for schools to ensure that public schools can achieve 100 per cent of the school resource standard. The ALP committed to restoration of $2.1 billion cut from schools funding by the Turnbull government across 2018 and 2019. They also committed to restore an AEU representative to the board of the Australian Institute for Teachers and School Leaders (AITSL). 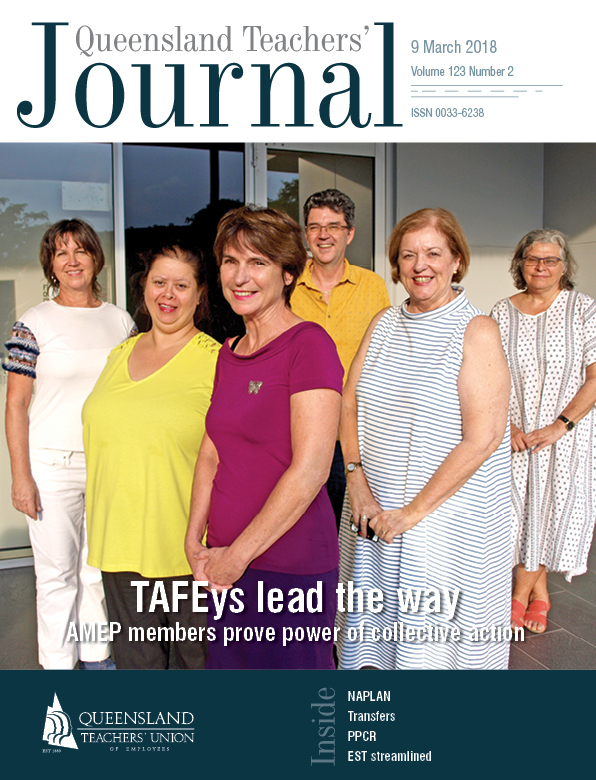 Conference reaffirmed the AEU’s call for 70 per cent of all training funding to be restored to TAFE, and noted the ALP commitment to guaranteeing two thirds of all federal funding for TAFE. This demonstrates the success of the Stop TAFE Cuts campaign. Each year the federal conference also receives reports from our teaching comrades from across the world. This year we heard from our brothers and sisters from the Japanese Teachers Union, Educational International Asia Pacific, the New Zealand Education Institute, and the National Education Union from the UK. We heard stories of the challenges many countries are facing with teacher workload, access to appropriate resources for public schools, the pressure of standardised testing and the privatisation and commercialisation of public education. Conference also presented the Arthur Hamilton Award for Outstanding Contribution to Aboriginal and Torres Strait Islander Education to the bilingual program at Yirrkala School Literature Production Centre (LPC). The school has developed in community partnership a model of self-governance to ensure that students from their East Arnhem Land community, on the traditional lands of the Yolngu people, have full bilingual and cultural programs that sustain their ancient language and culture and lead to improving educational outcomes. A conference statement has been adopted and will be uploaded to the QTU website.